It’s a statement, simple and direct, utilizing just three words. It’s also a directive, charging the listener to think about expanding their dinner choices and buying habits. And, for the past year and a half, it’s been a statewide campaign led by the staff of Wisconsin Sea Grant, designed to educate consumers on the availability and health benefits of sustainable and healthy fish farmed in Wisconsin or caught in the waters of Wisconsin’s Great Lakes. The first wave began with a surge of social science. Wisconsin Sea Grant social scientist Jane Harrison and education outreach coordinator Kathy Kline conducted multiple focus groups in Milwaukee and Madison to try to gauge consumers’ familiarity with Wisconsin fish and what, if any, barriers prevented them from purchasing and cooking it. They discovered there was a lot of interest…but not quite as much knowledge. Kline’s talking about the eatwisconsinfish.org website, packed with extensive information about the various types of Great Lakes and Wisconsin fish, a set of home preservation fact sheets and a map that displays locations where Wisconsin fish can be purchased. There’s also a Twitter stream (@EatWIFish) sharing weekly recipes and information about local seafood. One of the turning points for Eat Wisconsin Fish was a dinner event held last year at Madison’s Next Door Brewing Company, an event where AquaTerra Farms in Bristol, Wisc. supplied the locally produced fish and Next Door’s brewmasters paired a four-course meal with their craft beers. Earlier this month, Wisconsin Sea Grant organized another successful Eat Wisconsin Fish event in Milwaukee. Nearly 150 people descended on Braise Restaurant to enjoy Chef Dave Swanson’s take on Great Lakes mainstays like perch and lake trout and Wisconsin-raised arctic char. Again, Sea Grant staffers—Kline, Harrison and fisheries specialist Titus Seilheimer—were on hand to answer questions. Several customers found themselves enjoying Wisconsin-raised fish for the first time. As the calendar turns to 2015, those radar screens are changing as the Eat Wisconsin Fish wave continues to grow. Later this spring, Rushing Waters Fishery in Palmyra, Wisc. 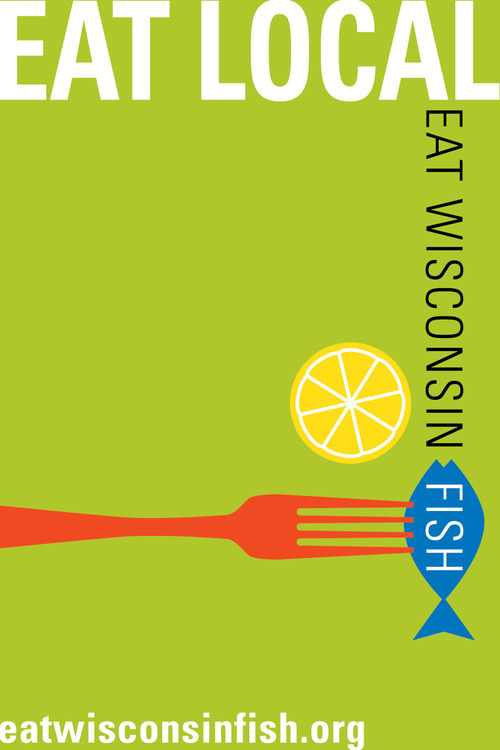 plans to host another Eat Wisconsin Fish event centered on their own fish products. Harrison, meanwhile, has applied for a Wisconsin Department of Agriculture Buy Local Grant. 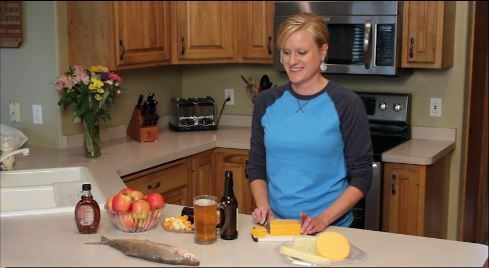 If she’s successful, it would fund further Wisconsin Sea Grant efforts to connect producers of Wisconsin seafood to retailers, restaurants and consumers. Kline also has some ideas as to which directions the campaign should tackle in its second full year, and many of them involve the state’s burgeoning aquaculture industry. For instance, where the concept of participating in a CSA—community supported agriculture—has taken deep roots among Wisconsin consumers, Kline sees the opportunity to create a similar model for state aquaculture. A CSF, or community supported fishery, if you will. “We need to reach out to aquaculture more,” said Kline, noting that the historical emphasis for Wisconsin aquaculture operations has been producing bait fish not menu items. That’s changing, she noted: The Dairyland Shrimp Farm in Westby is the state’s first, and Nelson’s Fish Farm in Lynxville now farms and sells Atlantic Salmon, a species that’s also one of the primary catches for Lake Michigan fisheries. Other building blocks are already in place. Wisconsin Sea Grant aquaculture outreach specialist Fred Binkowski, also a scientist with theUW-Milwaukee School of Freshwater Sciences, is the man who perfected a process that allows yellow perch to spawn year-round. Binkowski is currently working with Milwaukee-based Will Allen Farmsto produce and distribute yellow perch crops to local restaurants. And Wisconsin Sea Grant is also partnered with Chris Hartleb, UW-Stevens Point professor of fisheries biology and longtime Sea Grant-funded researcher and the UW-Stevens Point’s Northern Aquaculture Demonstration Facility, supporting the development of new sustainable fish species like saugeye. “2014 was a great year to start building the program and message in different outreach events<’ said Seilheimer. “Each interaction educated people on Wisconsin fish and then those people hopefully reached more. Once people start making the conscious choice to “Eat Wisconsin fish,” then everyone’s a winner! For more information on the Eat Wisconsin Fish campaign, visiteatwisconsinfish.org.